This print is a limited edition silkscreen featuring metallic & glow in the dark inks. Details below. 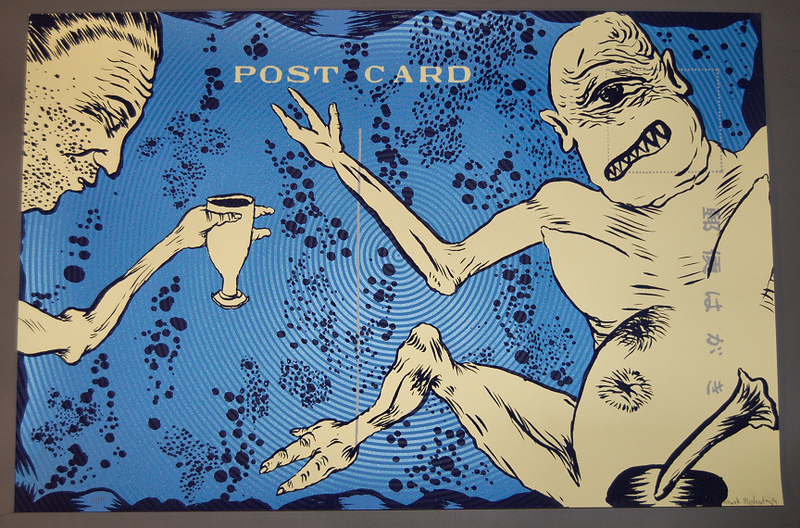 Mark Mothersbaugh, Drinkin' with Cyclops, 5-color serigraph, includes metallic & glow in the dark ink, signed and numbered edition of 80, 36 x 24 inches, 2009. Price: $50 USD + shipping. 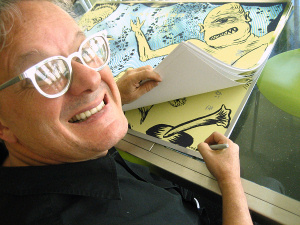 NOWhere Limited recently got together with D&L Screenprinting, one of the most amazing printmaking studios out there, to produce a limited edition serigraph by Mark Mothersbaugh. 'Drinkin' with Cyclops' by Mark Mothersbaugh is a limited edition of 80 prints, signed and numbered by the artist. This silkscreen features metallic ink, intricate design elements and glows in the dark! It will be available for purchase exclusively through NOWhere Limited this Tuesday. The price is set at $50 USD + shipping. 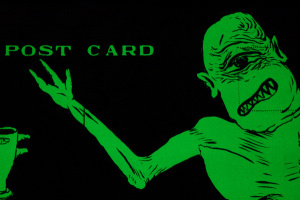 Mark's recent visual artwork has been largely inspired by his 30-year habit of creating handmade postcards to send to friends from various stops on DEVO tours. This obsession has evolved into a visual diary that currently yields the artist 1-25 new images per day. These images have served as the basis for the artist's critically acclaimed solo shows of the 80s/90s as well as for his "gallery tours" which have been occurring at art venues throughout the globe since 2003. With DEVO, Mothersbaugh's most recognized music project, the artist showcases his artistic abilities to millions of fans. Through their films, videos, costumes, LP covers, stage shows, and printed materials, Mark Mothersbaugh and DEVO forever altered commonly held preconceptions of how a rock band can function in popular culture.